In order to start selling points, we need to complete three tasks: First we need to setup the add-ons base settings, followed by enabling and setting up the Payment Gateways that will be handing the actual payments and finally, setup the shortcodes so users can start making purchases. 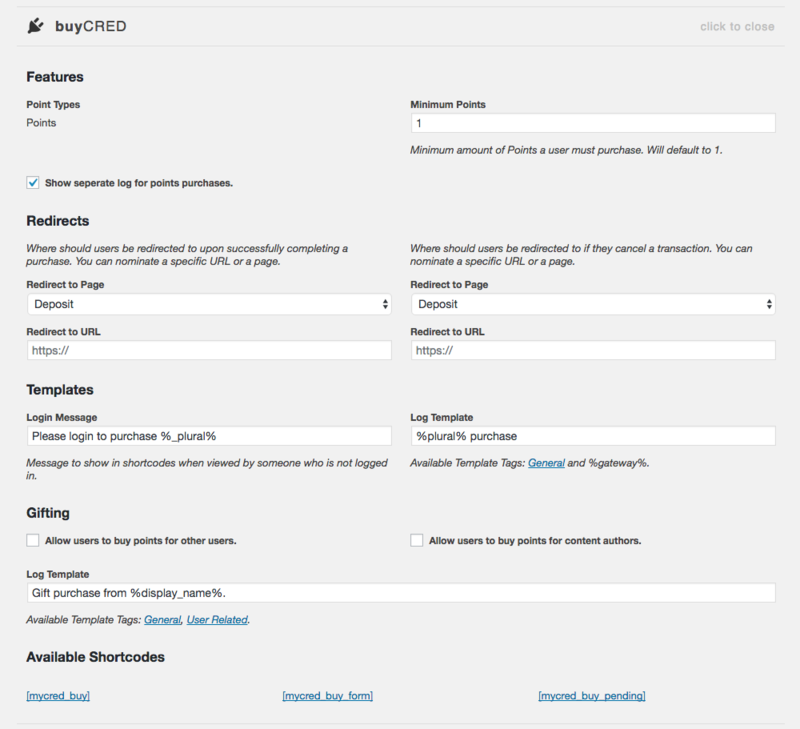 As of version 1.7.6 the buyCRED settings have been re-styled to better support mobile devices. The add-ons base settings contains options surrounding the purchase process. These settings are separate from the Payment Gateway settings however all gateways depend on these base settings when operating. If you do not go through and save these settings, no purchases will be possible. If you have more than one point type setup, you will also see them listed in your base settings. You will need to select all point types that a user can purchase. This setting is hidden if you only have one point type setup. Most of the settings are self explantatory. We need to set the smallest amount of points a user can buy (this is enforced in our shortcodes), the log template we want to use for each purchase and an optional message you want to show to users that try and buy while not being logged in. The “Thank you page” is used when a transaction is successfull and the “Cancellation Page” is used if the user cancels a transaction. All payment will be logged but for convenience you can select to enable the “Purchase Log” in which case a dedicated log page is added for you. Here you will be able to see all point purchases based on your log. None of the gifting related shortcode attributes will work if gifting is not enabled in your add-on settings! Once you are happy with your settings, remember to save. Next we will need to go through our Payment Gateways.